This is a tricky question because technically, any shoes can work with the Peloton bike as long as they have the proper pedals installed. The pedals on a Peloton, like most indoor bikes can be customized based on your preference. The stock pedals are compatible with only Look Delta cleats. Therefore to use those pedals, your shoes will also need to be compatible with Look Delta cleats. Compatible shoes will need to have three holes on the sole to allow for the cleats to be installed properly. If your shoes only have two holes they will not work with the stock Peloton pedals. Some shoes allow for either type. Others, like popular brand Tiem Athletic only make shoes that work with SPD. Your option here is to either replace your pedals or select new shoes. Switching out your pedals may sound daunting but is actually quite simple, as shown here by the pelo-infamous John Mills. Schwinn Triple Link Pedals are a popular option because they allow for both types of shoes as well as sneaker cages. Most gyms and studio bikes typically use SPD compatible pedals. A few (like SoulCycle and Flywheel) have double sided pedals that work with Look Delta and SPD. Ironically, commercial Peloton bikes in hotels typically have pedals with SPD on one side and sneaker cages on the other side, which means your Peloton branded shoes will not work with them. What is your favorite brand of cycling shoes? Have you tried switching out your pedals? This is the official recommendation from Peloton on how to clean your bike. Most importantly after you’ve worked out, you want to get your bike clean and dry as to not damage or rust any of the metal over time. If you sweat a lot, your first line of defense is a spintowel. I also like to use Force of Nature on one of these microfiber cloths – don’t ever spray anything directly on the bike! Force of Nature is a gentle but super powerful multitasking cleaner for pretty much everything in your house. It turns salt, water & vinegar into a cleaner, disinfectant & deodorizer as effective as bleach. It’s also super cool and costs less per ounce than anything else out there. If you prefer a disposable solution, Wipex or Lysol wipes will do the job but create needless waste. The amazon microfiber cloths work really well at cleaning up all kind of household mess and you can throw them right in the washing machine. And right now it’s a great deal, you can get $40 off Starter Kits plus free shipping with code KITFORTY. 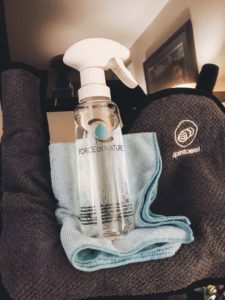 Do you have any favorite products for keeping your workout area clean? …aka say my name, say my name! It is the holy grail of Peloton, the elusive “shout out”. It’s one of the things that makes Peloton truly interactive and the part of the magic that keeps us coming back for more. With so many people on the leaderboard, how do you stand out? Here are a few tips to get yours. Take a live class. This may be obvious to most but if you’re brand new it may be unclear. The instructor can only shout you out if you are on with them in real-time. Choose your class wisely. The rides with the most live riders are going to be the hardest to get a shout out in. Do a little research and see how many people are “counted in” on the schedule to get an idea of how popular the ride is. Shorter rides during the weekdays are probably the lightest so if that can work for your schedule, you may have better odds. Ride for a meaningful milestone. While you may be super psyched about your 32nd ride in a row, you’re not necessarily going to be recognized for it live. Instructors are managing a leaderboard of hundreds if not thousands and getting to everyone is impossible. 100, 200, 300, etc. are most likely to get noticed and if you’re lucky maybe the 50’s too. Birthdays are also a good way to get recognized, so make sure the date is correct in your profile. Spread the word. Don’t be shy to tell your tribe, change your #location, and make it a thing. When enough people do so, instructors notice. More importantly do the same for other people! Most of the time, you get what you give when it comes to this community. Have an easy to read leaderboard name. If your name is long, has a lot of numbers or no capitalization, it can be hard for an instructor to spit out out while leading a class. If you’re willing to alter your Pelo-identity try to use real words or phonetic spellings so it is easy to read and to say. And yes, you can change your name without losing all your stats. Join class early. Live classes usually start 3 or 4 minutes prior to the recorded session and when the “lights go down”. During this time instructors casually chat with the people in studio. They also scroll through the leaderboard to see who is on and give quick shout outs. It might not quite be the same as getting it during that final hill but it is nice to know they see you and it can give your entire workout a boost. Tweak your ride numbers…slightly. Say for example your kid accidentally takes your 200th ride without switching out of your profile – you are not completely out of luck for the next 99 rides. You can go in and delete it and you will still show up under the instructor’s list of milestones. But please don’t abuse this, that would defy the purpose of a shout out! Share it. If you don’t get the shout out you were hoping for, do not take it personally it will not happen every time. If you left still craving a little attention for all of your hard work, post about it on the Facebook instructor’s page or tag them on Instagram. Express your gratitude for Peloton, the instructor, and your community. Be authentic and you’ll like get some extra love. Have any other tips for an epic shout out? Share them below!